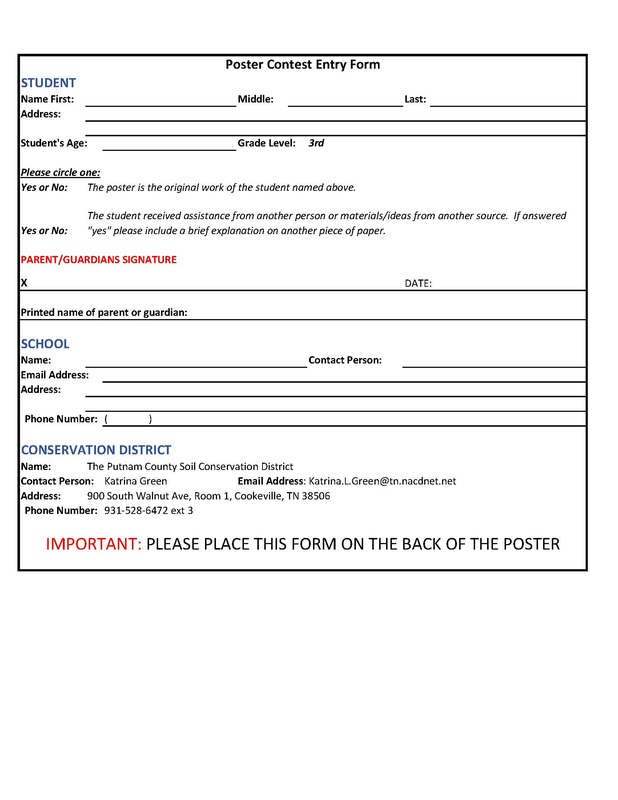 The Putnam County Soil Conservation District (SCD) is sponsoring a Soil and Water Stewardship Poster Contest for all third grade students in Putnam County and would love to see your school be a part of the contest. This is an annual event through districts in all states and will be Putnam County’s 2nd year. Designing a poster and researching the theme can give your students a voice in their community on important conservation issues. Good posters tell important stories to present and future generations. Also, posters capture people’s attention with a powerful graphic and inspire with a message for your community. Any media may be used, including: Paint, crayon, colored pencil, charcoal, stickers, paper, or other materials. Posters must be flat, they cannot be 3D. The poster size must be 14″ x 22″ (half a poster). The 2018 Stewardship theme “Watersheds- Our Water, Our Home” must be included on the front side of the poster submission to be eligible. The entry form included must be completed and signed by a parent or guardian. Although younger students will most likely receive help in planning from parents or teachers, Putnam County Soil Conservation District encourages each student to do their own work. Note: Entries with student handwriting and coloring will score better than those designed, drawn, and colored by adult assistance.